After an amazing night we woke up and had some breakfast again. We immediately went to the Sagrada Familia because we had a guided tour at the church. The moment we stepped out of the underground the church was towering above us. A beautiful and very impressive sight. Our guide told us that the front and another 10 towers needs to be built so I can’t even imagine how huge this church will be when it’s finally done. The ‘front’ we thought was the front wasn’t. The front isn’t built yet and they hope in 2026 the church will be finished because then it’ll be exactly 100 years after Gaudi’s death. But what we saw and what the guide told us was very interesting. Really, if you visit that church you need to have a guide. If you just walk around you miss so much of the thoughts behind the light, the towers, the front, the back, the inside. 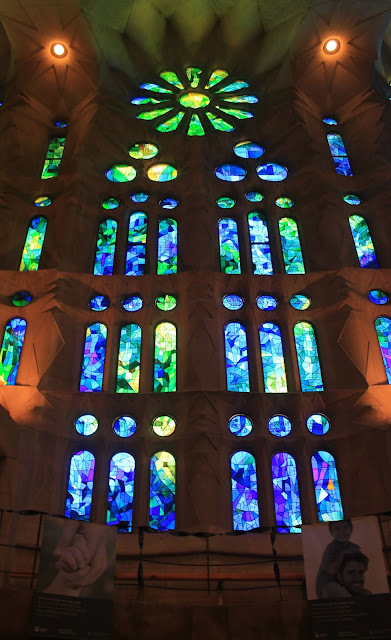 I loved how much thoughts Gaudi had put in the church and how the people who are building always keep in mind what Gaudi had planned for this church. And after walking around and some shopping we went looking for a restaurant. While walking around a lot of people from the restaurant are trying to talk you into their restaurant. After declining some we went into a cute restaurant which also had tapas and other Spanish food but also pizza. Because I was craving pizza I choose a pizza with olives, ham, cheese and mushrooms. I was so full but when we could choose desserts I immediately fell in love with the little chocolate cake. So I also choose a chocolate cake with melted chocolate inside. While we were eating 2 man came in and played guitar and sang songs which added something special to the evening. This was already our last night in Barcelona. Times goes so fast when you’re having fun. Unbelievable. Tomorrow the last day will be up. 1 comment on "Barcelona Day 3"